President Obama has decided to turn loose a bunch of Gitmo detainees, mostly cooks and janitors and doers of good deeds. Followers of al Qaeda and “multiple bad guys” are among the group of 17 detainees that the Obama administration plans to transfer from the Guantanamo Bay military prison in Cuba as early as this week, according to an individual who has viewed the list of prisoners. U.S. Sen. Michael Bennet, as usual, had nothing to say about it because he’s all for shutting down the prison in a non-election year. It’s time for President Obama to stop playing politics with our national security. He needs to hear the message coming loud and clear from military leaders, Congress, and from the American people themselves: Now is not the time to close Guantanamo Bay, and the President’s plan to bring detainees to the United States is dangerous, reckless, and wrong. We don’t know who these detainees are or where they’re going. The administration will wait until their release to give us the details, the Washington Free Beacon added. The release will reduce the number of prisoners to 90, but for how long, we don’t know. 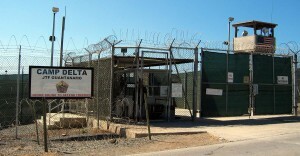 Judging by Obama’s record of transparency, we won’t even learn that Gitmo has been closed until we see the detainees waving to us from behind the fences of a Colorado prison. We, in turn, will be waving bye-bye to Bennet.